Easy as it might be to condescend to Andrea Bocelli in general and to this CD in particular, there's a lot of heart here. There's also a lot of history; this is the sort of material that Beniamino Gigli – and record buyers – loved in the 1930s, 40s, and 50s. With a voice like Gigli's, this sort of crooning religiosity was irresistible. Bocelli is no Gigli, but he's at least a Mario Lanza, and that's good enough for me. Bocelli was born in Tuscany in 1958. Although his family appreciated music and Andrea's natural talents, they encouraged him to pursue a more dependable career, and he chose law. Once he achieved financial security, he began formal training of his voice. One of his teachers was retired tenor Franco Corelli, whom Bocelli had idolized for many years before. Before long, Bocelli had attracted the attention of an Italian record company who successfully recorded him in popular repertoire. Then, in 1996, Bocelli made his recording debut in classical repertoire with Viaggio Italiano. 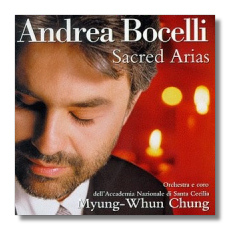 1998's Aria was his international breakthrough CD, and Sacred Arias continues the pattern. A complete recording of La Bohème is in the works, as is a disc of Verdi arias. This music has fallen out of fashion in our cynical age. Much of it may seem corny or excessively lachrymose (what about the Intermezzo from Mascagni's Cavalleria Rusticana tranformed into a "Sancta Maria" for tenor? ), but it is sincere, and it is grateful to a ringing tenor voice such as Bocelli's. Rossini's "Cujus animam" (from the Stabat Mater) and "Domine Deus" (from the Petite Messe solennelle) seem made for a young Manrico; introspective and tender selections, such as the "Pietà, Signore" (now attributed to Niedermeyer, but formerly to Rossini and Stradella) display another side of the tenor's personality. It's not really a Christmas album (despite the presence of "Adeste fideles" and "Silent Night." The only false move is the last selection, a bombastic "Gloria a te, Cristo Gesù" written by Father Jean-Paul Lécot, a priest from Lourdes. This is a new work, apparently made of one part opera and one part Broadway. Perhaps the arrangement (not by Lécot!) is what sinks it. Bocelli is not flawless. His high notes, especially those that are attacked suddenly, can be a little strained, and some of his scoopy phrasing betrays the fact that, at least at this point, the pop world seems to own as much of him as the classical world does. His sense of Mozartean style is no more assured than Gigli's, his Wagner "Der Engel" is just wrong, and his emotional response to everything else on this disc is not dissimilar to Corelli's – and Corelli was not the most subtle of tenors by a long shot! Nevertheless, Bocelli's voice is the real thing in what seems to be an age of imitations. I would rather hear an hour of thrilling singing in imperfect taste than five minutes of genteel, faceless boredom, which is all too common these days. If Bocelli is "too popular" for "serious" classical critics today, one wonders how they would have reacted to Caruso and Gigli in their glory days. In spite of its imperfections, Bocelli's ardent and ringing voice is a boon to the world of opera. Hearing him in this repertoire gives me a taste of the good old days. Chung and the Italian orchestra give Bocelli lavish support, and Philips's recording makes everything gleam and shimmer, which is how things ought to be. I will be keeping my eye (and ears) on Bocelli – a tenor who is more than he might seem to be at first.